We at VTEA provide comprehensive consulting and solutions to contain Harmonics in the electrical systems arising from the presence and installation of non-linear electronic devices. The team has an end to end understanding on Harmonic Mitigation to the levels, stipulated by the DISCOMS. We work closely with customers to carry out studies relating to harmonics at their sites and provide customized cost-effective solutions. Electrical Loads can be broadly categorized into linear and non-linear loads. When the load draws a sinusoidal current at the same frequency as the voltage it is classified as linear load. Examples of linear loads are resistive heaters, incandescent lamps, and constant speed induction and synchronous motors. Certain loads draw non-sinusoidal current from a sinusoidal voltage source. Such loads cause the current to vary disproportionately with the voltage during each cyclic period. These are classified as nonlinear loads, and the current taken by them has a non-sinusoidal waveform. Current harmonics are caused by non-linear loads. Examples of non-linear loads include common office equipment such as computers and printers, Fluorescent lighting, SMPS, battery chargers, variable-speed drives, electric arc furnaces, static VAR, inverters etc. What are the industries effected by Harmonics? In the past, non-linear loads were primarily found in heavy industrial applications such as arc furnaces, large variable frequency drives (VFD), heavy rectifiers for electrolytic refining, etc. power electronic device (computers, servers, monitors, printers, photocopiers, telecom systems, broadcasting equipment, banking machines, etc.). 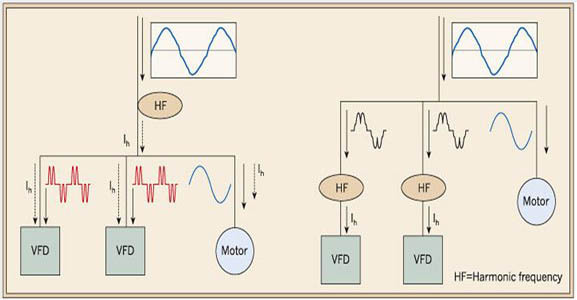 What are the effects of Harmonics in the system? Overheating of electrical distribution equipment, such as cables, transformers, standby generators, etc. Harmonics overheat equipment by several means. For example, in electric machines and transformers, harmonic currents cause additional power losses by (i) increasing the eddy currents that flow in their laminated cores, (ii) through increased leakage currents across insulation and (iii) by producing skin effect in conductors.